Der Alte Fritz Journal: So What's Wrong With Imaginations? So What's Wrong With Imaginations? A contemplative moment amidst the Battle of Aspern-Essling, done in the SYW manner. I recently read a blog that has taken a few "swipes" at the concept of "Imaginations" and the blogger saying that his way of wargaming is the best way. Several other blogs have played a similar tune from time to time, so I thought that a rebuttal of sorts was long overdue. Well, it is OK to have an opinion (even if it's wrong), but we wargamers live in a big church and there are hundreds or more ways of approaching the hobby of playing tabletop games with the Little Men, as many of our wives and sweathearts call them. The term "Imaginations" refers to the invidual's creating of imaginary nations, hence the mash of the words into "Imaginations". Prussian/Germanian infantry defend a town against French/Gallian attack. I think that it is rather sad that some people feel the need to put down the efforts of others. For one thing, most wargamers are doing the best that they can with resources and talents that they have. We should encourge them for their effort. For another thing, it can come across as arrogant or elitist for a person to say that his way is the best way of approaching the hobby. And finally, it's a hobby, not a contest. * the majority of wargamers like to build historical armies and recreate historical battles on the tabletop in order to see if they could have done any better than Lee at Gettysburg or Napoleon at Waterloo. They might also create fictional battles (and often do) and scenarios for their tabletop wars. Think about it, if you are playing a fictional scenario that might have happened between the Austrians and Prussians in the Seven Years War, then you, my dear hypocrite, are already engaging in the employment of your imagination to play in a wargame. This is the lane that I choose to play in most of the time. * an even larger community of wargamers dwell in the fantasy realm of Hobbits, Dwarves, Orcs and other monsters and enemies. This is not my cup of tea, but let us give Fantasy its due because the number of Fantasy gamers and the amount of money that the segment of the gaming industry generates quite simply dwarfs that of historical miniature wargaming. * back in 2005 or there abouts, Patrick Lewis created a Yahoo Group titled "Old School Wargaming" (or "OSW") that celebrated the "good old days" of wargaming with the likes of Donald Featherstone, Peter Young, Charles Grant and Peter Gilder, among others. 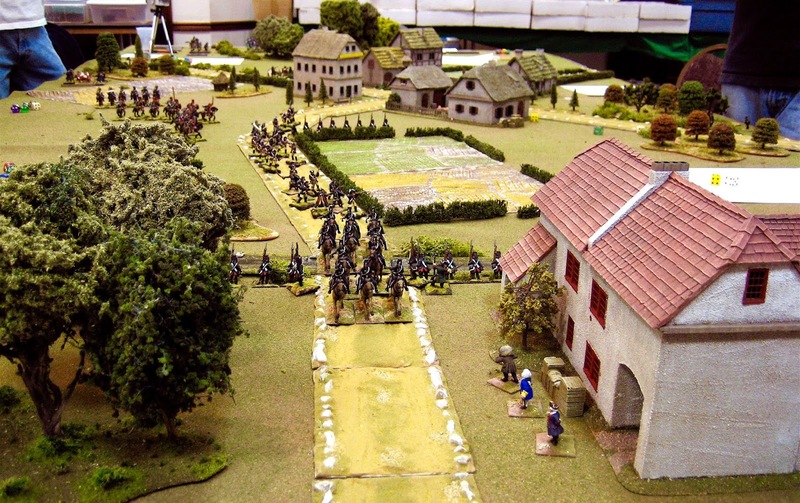 Patrick talked about the influence that Charge and The Wargame had on his nascent wargaming career and how it directed him towards the 18th Century. He would fondly recall building armies with simple figures such as Suren/Willie, Staddens, RSM/Pax Britannica, Minifigs and many others. 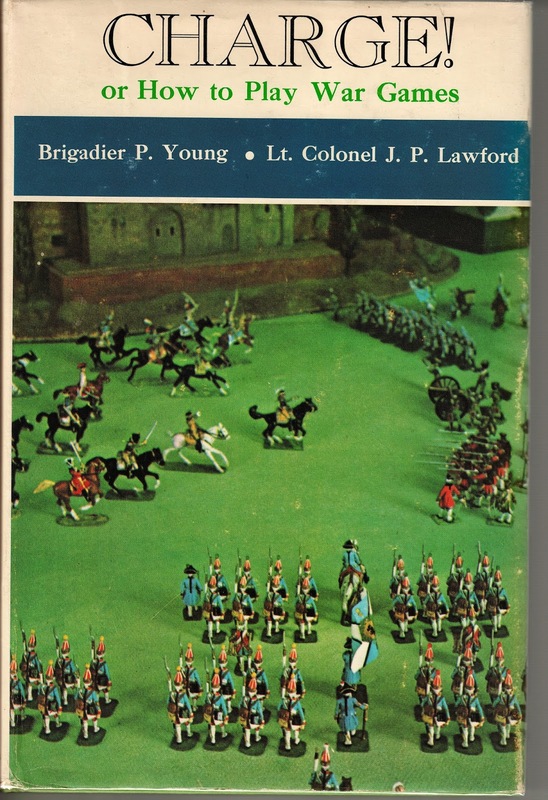 The book that started it all - Peter Young's CHARGE! 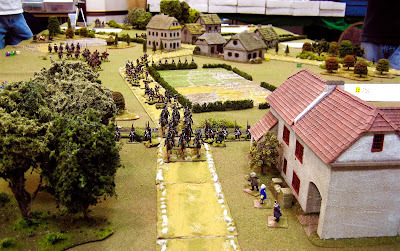 Quite a large number of wargamers were drawn to this new Old School Wargaming thing and the number of visitors on the group site grew and grew. At the same time, the same people caught the bug to create their own little countries and rivalries in the manner espoused by Peter Young and Charles Grant. And before you knew it, there were little principalities, dukedoms and electoral states popping up all over the internet. A kindly gentleman named Jeff Huddleston creating a central warehouse of all these imaginations on his blog titled "Emperor versus Elector". It was a place where the denizens of imaginary nations set in the 18th Century could congregate and carry out their diplomatic affairs with other nations. Jeff added a long list of links to various blogs that updated (not sure what you call this, "streaming" or something like that) in real time. You can visit the site and see when one of the blogs had posted a new entry on its blog. This remains a valuable tool to this very day, and I admit that Emperor versus Elector is one of the first sites that I visit on nearly every day. Let me be very clear about in my opinion that Old School Wargaming and Imaginations brought a lot of new people into 18th Century wargaming and anything that expands this population is a very, very, very good thing. Period! 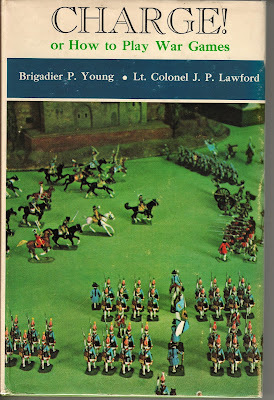 "I always have a wry smile when those who denigrate imag-nations in their next breath say that it was "CHARGE" or "THE WARGAME" that got them into 18th Century wargaming, or what classics they are! Two of the most imagi-nation centric books on wargaming that I can put my hand on. I am only starting down my imagi-nation road, but it is one that I have tinkered with on paper for years. Why? Two reasons: First - I love the process of bringing into existence two sides, that have no historical baggage, and Second - an imagi-nation campaign, even just linked battles, is fun to devise and run - even as a solo project." An interesting observation that checks two of my own boxes - the fun of scribbling on a piece of paper your ideas for creating an army, and it goes without saying, drawing up imaginary lists of figures that I would want to purchase for a new Project. I hark back to Hal Thinglum and his MWAN publication - he had an infectious way of talking about Projects and Lists of Figures that will always stick with me. The second check box for me is the fact that the two (or more) sides/countries have no historical baggage to contend with. Which countries had good armies and which ones had poor armies? It doesn't matter when the combatants are of your own creation. The imagination has a wonderful side benefit, that is, over the course of the years it allows you to create characters and watch them develop over time. In my imagination of Germania (Prussia) there is an undercover agent or naer do well named Lady de Winter who works mysteriously around the edges of our games. Lady de Winter has an obsession with collaring a ditzy English heiress named Lady Diana Pettygree. These two ladies have crossed path during many of our games and the competition has a sort of "Road Runner versus Wile E. Coyote" feel to it. I haven't enough fingers and toes to count the number of times that Lady de Winter almost captured Lady Pettygree, but she never quite manages to nab her adversary. One of the fun parts of this rivalry is that Lady Pettygree has no idea that some evil woman has it in for her, which makes the whole thing even more delicious. The infamous Black Hussars of Lady de Winter's personal army of evil doers. Lady Diana Pettygree is said to have passed this way. Circa 2007, I was attending the annual Seven Years War Association in South Bend, Indiana where I was hosting a wargame featuring Austrians and Prussians fighting over something, I forget what. On the table next to me was a game hosted by Bill Protz that featured large 48 and 54 figure infantry battalions fighting in three ranks, just like the actual soldiers would have done in 1757. Bill was hosting an French & Indian War game at the time. I found that as my game progressed, I kept looking at Bill's game and admiring his big battalions. After both of our games concluded, I ambled over to Bill and told him how interested I was in his game (which won the Best of Show award that year). Bill told me that his game and rules were strongly influenced by Peter Young and his book "Charge". As the conversation continued, I got around to asking Bill whether or not he had ever considered doing this in a European setting. Well, like minds converged and soon we were both building large armies with 60-figure battalions and 12-figure cavalry squadrons. After a few months, we finally had painted enough figures to have a game on Bill's giant 6ft by 24ft game table. 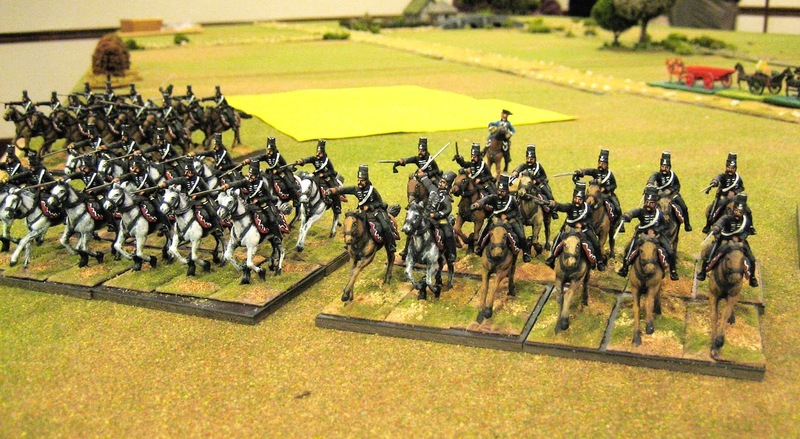 Big Battalions of infantry, supported by equally large cavalry regiments, in one of our Old School battles. Paying homage to messers Young & Grant, we created fictional countries for our armies. Bill had an affinity for the French and so named his country "Gallia", while my affinity for all things Prussian led to the creation of my country, Germania. The armies had fictional names and nations, but they were in fact French versus Prussians on the tabletop. You see, you really can have your cake and eat it too by having both historical and imaginations at the same time. What do you do with big battalions? You play in big games! I have always been rather enamored with Peter Gilder's Wargame Holiday Centre, having visited it twice when it was owned by Mike Ingham. As a consequence, I wanted to fight similar big battles at home and at game conventions in the USA. Hundreds of Prussian and French cavalry cross swords in an imaginary battle scenario. On at least four occasions, probably more, I organized large games at a local hotel for our SYW games. We played SYW versions of the battles of Rossbach, Gettysburg, Antietem, Aspern-Essling and Austerlitz with our armies. We often had 20 players in these games, ten per side. We would set up the table terrain and place the troops on the table the day before the game. This way, the gamers would arrive and could pitch into right away. Each battle had to have a Raison d'Etre so I would create a back story to the battle and give a name to each player's general. Several times I went the extra mile and scribbled out general orders and missions for each person on a paper scroll that I sealed with red wax and the letter F for the French and P for the Prussians. We had a lot of fun with that. Sometimes two players on one side had conflicting missions and this had the potential to create even more fun and mahaym in the game. So I have nothing but warm feelings about Imaginations armies and wargames. I caught this particular SYW bug from Young and Grant. If Imaginations were good enough for them, they are good enouigh for me. The concept of Imaginations in wargaming has attracted a lot of new people into the SYW era of historical miniature wargaming. Anything that brings in new blood to the hobby should be celebrated rather than disparaged. As I said earlier, there are many different approaches to the hobby and the diversity of ideas on how to wargame is one of the things that make this such a great hobby. Good post! Imagination armies isn't my cup o tea, but I can see the appeal if creating a force with whatever colour uniform you want. Here at Reject HQ the majority of games we play are made up battles for whatever period we're playing. Historical refights are difficult to do, as one side always seems to have the upper hand from the start, especially the Prussians! Another splendid post . Jeff and E v E were such an important part of my gaming. I recall being invited to join the E v E family of nations by him and how things took off from there. Figures sent across the Atlantic to fight on other,s tabletops, visitors arriving by post to my imagination The Duchy of Tradgardland as part of their Grand Tour and the joy of sending them to the next port of call. I feel that has gone from 18th century gaming on the whole,that community surviving in individual blogs but lacking a central unifying focus. I miss the interactions with Bill and yourself and waiting to see how the latest campaign game had gone on someone else’s blog. Perhaps there is no call/desire/ need for such a community now but l am not sure. With Facebook we could do it once more ,is anyone interested? I think that in honor of Jeff, no one wants to make the next post on the EvE blog and bump the final post down, hence there are no new posts there. As it should be. However, EvE lives on as a place to see which blogs are updating. A wonderful post and your points a very eloquently put:). I was drawn to 18thC wargaming via my good friend Keith Flint (of Honours of War fame), which then led on to an interest in the Old School rules that I had missed out on due to growing up in a village. These rules, combined with some excellent Blogs, sparked an interest in Imagi-Nations, whether they be 18thC or not. Ultimately my plan is to have the same States fight from the late 17thC through to the mid 19thC. I doubt I will ever achieve this but I'm having great fun in planning it which is what gaming should all be about. A very nice summary. Is it ironic that reading this I now feel a bit nostalgic for the early days of the OSW group ? One often over looked period where imaginary conflicts are commonplace is the English Civil War. Small campaigns set in fictional counties such as Borsetshire are a commonplace. Again a setting which lends itself to the development of characters and ongoing scenarios. I have lots of fond memories of the early days of the OSW group -- all the new friends that I made, the rediscovery of old figure ranges, and the introduction to certain books for the first time. One could also use a Sharp Practice style system and play small table games with a few figures from your various imagination forces. Couldn't agree more. What I like about Imagination gaming is that it is a creative exercise - maps, histories, personalities; and the gaming brings it all to life! Yes, making maps is one of my favorite things and this begets creating a back story and characters (which recur over the course of many games). Great post. It never fails to wind me right up when the 'your doing it wrong' brigade surface to take pot shots at one part of the hobby or another. I personally love the freedom of making up narratives and settings regardless of the period (been ECW of late). After all surely this hobby thing is ment to be fun?. I have never seen a problem with Imagi-nations. The US Army has always used made-up countries with complex backstories to drive training. I also find that such made-up countries work beautifully for creating campaigns as I don't have to deal with preconceived notions about Prussians, Russians and Poles and accompanying rules modifications. RE: preconceived notions, a great comment. In our campaigns and battles all battalions and regiments started as Trained category and then advance Veteran after 2 battles. If they do something heroic or capture some colors then they can be moved up to Elite, so we do not favor any one side. Interesting that the US Army uses imaginary countries in their Wargaming exercises. I agree, all gaming is fantasy to some degree, Imagi-nations are fine, so long as they aren't used to produce super armies. I am in process of helping our club start an imaginations campaign, and we are using historical armies as templates. I cannot conceive of wargaming NOT including imagi-nations! I've had them since I was a pre-teenager (Opeland and Upsland) and developed quite a few since. Interesting post, Jim. I attended one your huge SYW games at a hotel and had a very good time. The spectacle was inspiring and comradeship outstanding. I, too, used to enjoy running very large games. My SYW collection 3.0 is finished and I finished mounting them a year ago. It was always my intention to play some Imagi-nations games. Perhaps I will. Good stuff. That was one of our best games ever with lots of good sportsmanship and lively banter and comraderie. Please ignore the "Nay sayers", as has been said we all indulge in this "heresy" every time we create a fresh scenario or fictional battle; which I do every week! You articulate my own feelings very well, we play Maurice from time to time & Napoleonics far more often, mostly all pure invention, who can't fail to love the creative process & the outcome? Apparently some sloth minded laggards do! A fine and well-argued posting. But of course, I am one of the converted - or would be if conversion were ever needed. A look at my armies of Trockebeeren-Auslese, Altmark-Uberheim, the Grand Duchy of M'yasma will reveal a marked similarity to the Hapsburg Empire, the Kingdom of Prussia and to Russia of the 7YW. Not exact, of course: the figures were generic, pretty much. I enjoy creating imagi-Nations, naming the counties therein, and the major characters. My own Archduke Piccolo blog is named for a major character, a nephew of Emperor Violoncello, and cousin of the Archduchess Harmonica, the Emperor's elder daughter. My 19th Century RED and BLUE armies become the forces of Ruberia and Azuria, the one vaguely British, the other vaguely French. Sometimes the BLUE army becomes TURQUOISE - the Army of the Settee Empire, Turkowaz. But sometimes history itself will furnish a name one can not go past. My Ionian Empire (I am very fortunate in having a whole littoral named after me!) is headed by the Emperor Dementius, with Michael Psychopathes and Demetrius Krazios commanding in the field. The historical character? George Maniaces, who becomes the third of my trio of Strategoi. It does not stop my army being painted up as 10-11th Century Byzantine! I could go on, but maybe that should be a matter for posting on my own blog! This was a very well put post! I enjoyed your point that even historic armies can engage in non-historic battles and thus are "imaginary". I've never created an Imagi-nation in the proper sense, but have no trouble slipping all sorts of non-historic characters (like those from movies) into my gaming. After all, this hobby is about having fun. Why should anyone criticize anyone else's approach to it? Naturally I agree. J'suis d'accord! 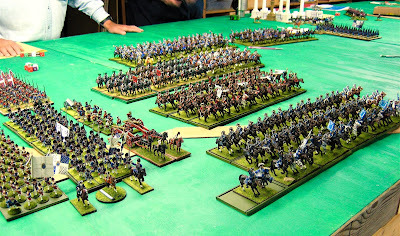 For several years long ago we had an Imaginations game at the annual Seven Years's War Association weekend. As I recall roughly ten-ish attendees brought their own BIG battalions to play. I wonder if we could not do that again in 2020? Jim and I also wandered over to India a few years ago inspired by Jurgen's SYW India games. There Gallia and Britannia are ever battling each other with indigenous allies. Most of the latter are the Pathans which fight General Pettygree in the 1890-1905 time period. Elephants and all the rest. Tremendous fun and satisfaction imagineering it all. What are the 2020 dates l might try to come across for it? It is usually the last weekend in March unless that particular year's weekend is Easter, then we move it forward or backward one week. We usually set the date during the current year's convention so I can post the information later this year. Jim, your blog was one of the reasons I entered the Imagi-nations world. And my enjoyment has been increased with the exposure to the E v E blog and Bill Protz's rules. I even enjoyed two massive games at Millenium Con 2008 and gamed across the table from Monsieur Protz himself! P.S. I also think a massive "bring your own" game at the SYW Convention might possibly encourage me to come. An interesting and thought-provoking post. I find ImagiNations gaming a tiny bit frustrating not having painting guides etc but then also enjoy the creative and imaginative freedom to design it yourself. Imaginations have a long history - back as far as Gullivers Travels? I have slowly been untangling and exploring the juvenile fictional worlds of the Angria, Glasstown and Gondal sagas created by the Bronte sisters and brother in the 1830s. One reason that I enjoy such ImagiNations gaming is that it does away with criticism of wargamers ignoring or trivialising the unethical and unpleasant atrocity and suffering aspects of recreating real wars. If these nations, armies, units and battles never existed, no one gets hurt. None braver than a toy soldier! It foregrounds the fictional toy soldier aspect of war gaming with “No lead orphans” as Donald Featherstone would say. H.G. Wells summed it up well in the closing section of Little Wars. The largest wargame company of the world - Gamesworkshop - product line is entirely imaginations. Im a bit late to the discussion re imaginations Jim. Sorry for that. Frankly Im surprised there is a need for this conversation given how the whole concept of wargaming is based around one's imagination. It doesnt really matter if one is a uniform pedant and insists on rigidly formed and painted figures they are still going to be used by a wargamer who needs to have sufficient imagination to actually 'play' the game. I suppose if one is a collector then there is only the need to paint the figures as per the historical records. But even then I would question the actual veracity of the dress codes of the soldiers given how most were pre the industrial revolution. I often think that Charles Grant opted for imaginations simply because there was a sevre shortage of information available at the time. That said he clearly possessed a wonderful sense of fun and wanted to create his own history. Wargaming is a very broad church and thrives because of that. Perhaps people denigrating imaginations should opt for anther hobby and leave the majority to enjoy their toys in peace. 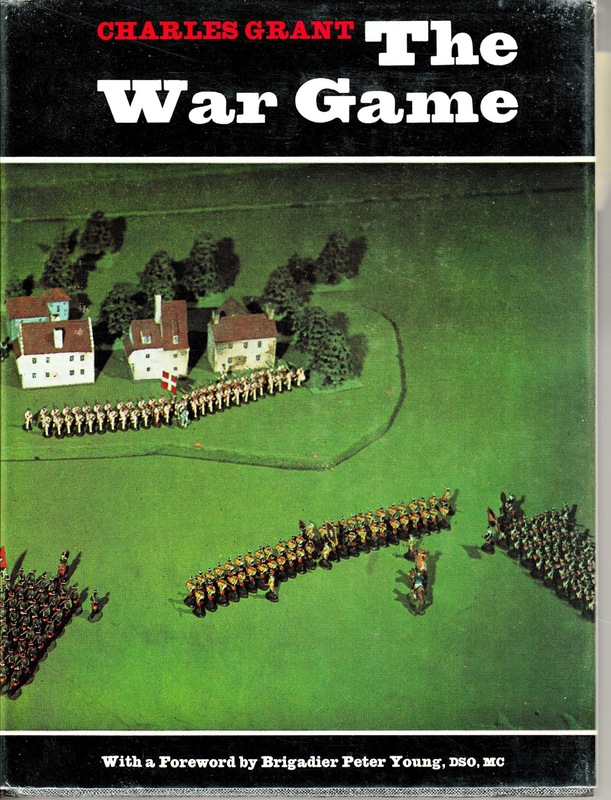 Reading CS Grant's The Wargame Companion provides a lot of the back story to the Family Grant's take on Wargaming and is well worth the read. Excellent post Jim, well said. I would argue all wargaming is imagination. Couldn't agree more with this Jim. Well done. I hope some of the sceptics read it and are convinced by your arguments.